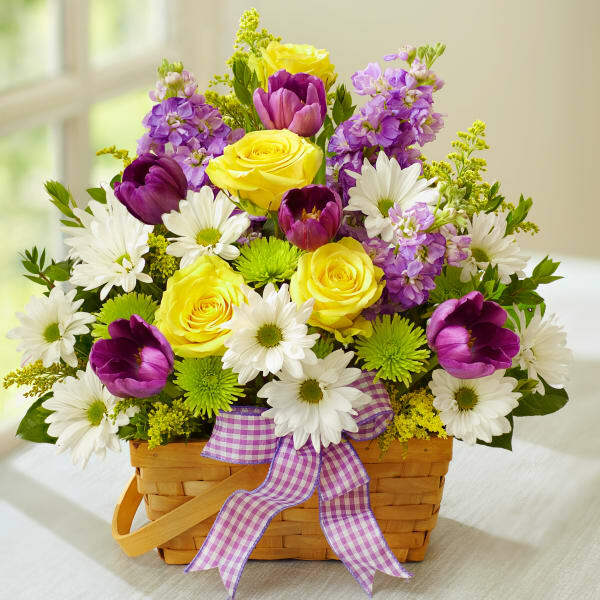 Express your heartfelt sympathy with this charming, garden-inspired bouquet. 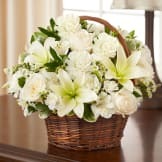 Designed by hand in a split wood basket with vibrant tulips and roses, it's a beautiful tribute to a life well lived. • Fresh bouquet of yellow roses, assorted tulips, lavender stock, white, yellow and lavender daisy poms, athos pom, solidago, salal and myrtle. • Expertly arranged in a splitwood handled basket with liner, accented with a gingham print ribbon; measures 9.5”L.